Published on September 10, 2013 in General T&T, Media, Parliament, People's Partnership, Politics and UNC. Closed Tags: Budget, Kamla Persad-Bissessar, Larry Howai, Politics, T&T Govt. FINANCE Minister Larry Howai yesterday unveiled a $61.4 billion budget, yet again the largest in the country’s history. The 2014 package — the PP Government’s fourth — includes what the Minister said was also the largest-ever capital programme of $8 billion. However, the deficit projection will shrink relative to overall productivity coming in at $6.3 billion or 3.6 percent of GDP. 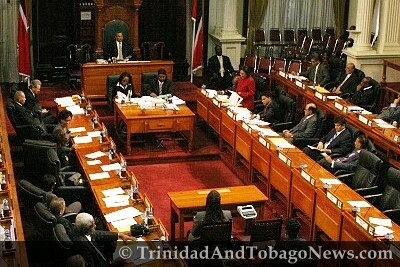 The package saw the minister announce that a special fund will be set up to compensate the victims of car accidents involving uninsured drivers; Land and Building Taxes would return on a phased basis, but low income homes would get concessions; the $504 million fuel subsidy for Caribbean Airlines Limited (CAL) would be removed; a system of health cards would be introduced as a precursor to a national health system; 2,750 houses would be built in three years; and 6,000 new police officers and SRPs would be recruited. Some new and foreign-used car buyers will pay more from next month, an electronic health card is being introduced and homeowners will be the last to resume paying land and building tax in a phased-in regime between 2014 and 2017.